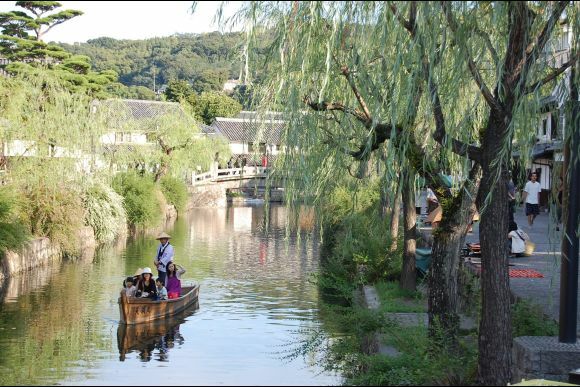 Okayama is a small city, a little off the beaten track. Overshadowed by its neighbors, Hiroshima and Kobe, it’s easily overlooked by travellers. It makes a fun day trip if you’re planning a visit to the Kansai or Chugoku area of mainland Japan. It has warm, friendly people and its famous for white peaches and the story of Momotaro: A child born from a peach who fought demons with his animal friends. So, start at Okayama station and head to the tourist Information booth, between the entrances to the JR and Shinkansen gates, to pick up some English maps! Armed with your map you can get your bearings of the city outside the east exit of Okayama station. Head down the escalator from the tourist information booth. The Momotaro statue will come into view and so will the small groups of people hanging out. Its role is very similar to the Hachiko statue in Shibuya, Tokyo. It’s the hot meet-up point so it’s perfect for sitting and people watching. It’s also a great photo-op, with a giant peach-shaped water fountain in front of the statue. Follow Momotaro’s gaze and you’ll see the tram waiting just across the street. Okayama has it’s own tram system connecting you swiftly and easily with all of the main sights of the city. You can get a day pass for 400 yen. A single fare is from 100 yen to 140 yen. It runs from around 6am to 10pm and if you’re lucky you’ll get to ride the Tamarun cat themed tram! The tram will connect you with the main shopping area – get off at Yubinkyokumae (100 yen) for shopping and cafes, like the LOFT and Takashimaya department store. From here you can walk through their covered Omotecho Shotengai street. It features traditional local shops, with kimono and handmade goods. It also features big chains, like the Maruzen book store and Tenmaya department store. You can pick up some traditional snacks and enjoy Okayama’s traditional sweet – kibidango. They are jelly-like balls made from millet-flour, with a soft and sweet taste. According to legend, the kibidango were fed by Momotaro to his allies when fighting demons. The Omotecho Shotengai extends from Shiroshita tram stop to Saidaiji-cho tram stop. Sega Joypolis is a nation-wide game center chain featuring arcade games, purikura photo booths and those infuriating crane games. Heading east from Okayama station and taking a ten minute walk down Shiyakusho-suji street will lead you to Okayama’s main game center. You can try your hand at various Japan-only arcade games, flipping tables or hitting taiko drums and burn through your 100 yen coins trying to win adorable toys in the crane machines. They also have bowling and a kids play area too. Open from 10 am until midnight every day. Also, one weekend in early August is the annual Momotaro summer matsuri festival. You can see Okayama’s unique Uraja dancing troupes fill the street from the station all the way to the front of Sega Joypolis. The Okayama Digital Museum is the only museum located on the west side of Okayama station. It’s a one minute walk from the west exit. It contains unique displays about Okayama itself and it’s interactive exhibitions are intended to pass the history of Okayama onto younger generations (10am-6pm. 300 yen). The Okayama Prefectural Museum of Art (9-5pm. 350 yen) and the Okayama Orient Museum (9-5pm. 300 yen) are next to each other in front of the Shiroshita tram stop. They’re both large art museums often featuring temporary visiting exhibitions. The orient museum is one of the only museums specialising in oriental culture in Japan. The Hayashibara Museum of Art (10-5pm. 500 yen) is a short walk from the Kenchodori tram stop. Formed from an old guesthouse, this quant museum focusses on traditional items. Such as, kimono, pottery and swords. Finally the Yumeji Art Museum (9-5pm. 700 yen) is located across the bridge from Korakuen garden on the north side. This museum is dedicated to the Art Nouveau devotee, Takehisa Yumeji, who was born in Okayama prefecture. Korakuen is one of the top ranked gardens in Japan but isn’t well known. When you say “korakuen” the more famous Koishikawa Korakuen garden in Tokyo comes to mind. Poking out between the trees in Korakuen is a beautiful view of the nearby Okayama castle. The castle was rebuilt after the war and with its signature dark roof, it was nicknamed “Crow Castle”. Korakuen is a small but impressive garden and can be explored within 30 minutes. It has cherry blossoms, plum blossoms and maple trees which can be enjoyed throughout the year. Tea and rice are also grown in the gardens so you can get a taste of the countryside within the city limits. They have small teahouses where you can enjoy a bowl of fresh green tea with Japanese sweets. It’s also a common sight for locals to have their wedding photo shoots within the garden walls, so you might be able to see the beautiful sight of newlyweds in traditional Japanese outfits. The Shiroshita tram stop is the closest tram stop. At the intersection there are signs in English pointing the way. The walk takes around 10 minutes but it offers beautiful views of the moat and castle through a small park area across a scenic bridge. Admission separately is 400 yen for the gardens and 300 for the castle, but a combined ticket for the day is 560 yen. The gardens are open in spring and summer from 7:30-6pm and in fall and winter it’s 8am-5pm. Okayama castle is open from 9am-7pm. Enjoy your day in the little city of Okayama! Flying from Tokyo takes around 80 minutes and the bus into the city takes another 30 minutes. It’s also easily accessible by shinkansen from Tokyo (3 hours), Kyoto (1 hours), Osaka (45 minutes) and Hiroshima (30 minutes).